WHETHER it's shooting or passing, third-year guard Terrence Romeo has found a way to shine early in the PBA Commissioner’s Cup. 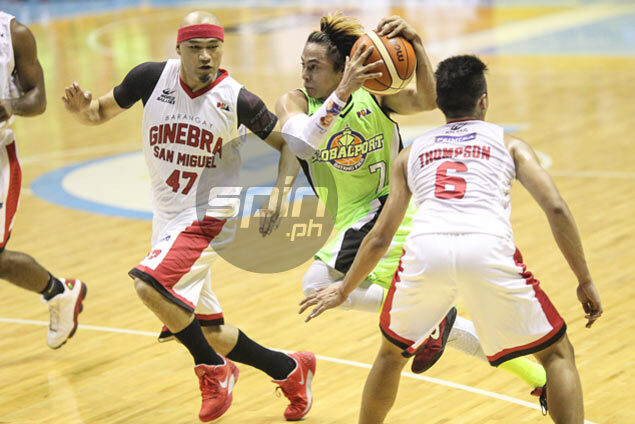 After opening the conference with a career high-tying 41 points in GlobalPort's 98-111 loss to Mahindra, the 5-foot-11 guard made a more conscious effort to set up his teammates and finish with six assists against Barangay Ginebra. But come crunch time, Romeo came out firing once again by hitting the go-ahead three-pointer in the dying minutes that knocked the wind out of Ginebra and helped GlobalPort seal an 89-85 win on Valentine’s Day. Romeo, who is turning 24 next month, went on to earn the first Accel-PBA Press Corps Player of the Week citation of the conference, besting Meralco Fil-Am forward Cliff Hodge and Blackwater’s sharp-shooting guard Carlo Lastimosa. The cat-quick GlobalPort guard finished the opening week of the mid-season conference with averages of 31.0 points on 47.2 percent shooting from the field, to go along with 4.5 rebounds and 3.0 assists. GlobalPort will take a four-day respite before returning to action this Friday when it faces defending champion Tropang TNT at the Mall of Asia Arena.